When it comes to smartphones they all have their time in the limelight, but one handset has kept in the media eye for almost eight months now, and that is the Droid Bionic. The reason for this is not because it will be the best Android phone, but because of the design changes and also constant delays. Now that the smartphone is imminent we thought we would offer up 5 infographics, which we hope you find enlightening? 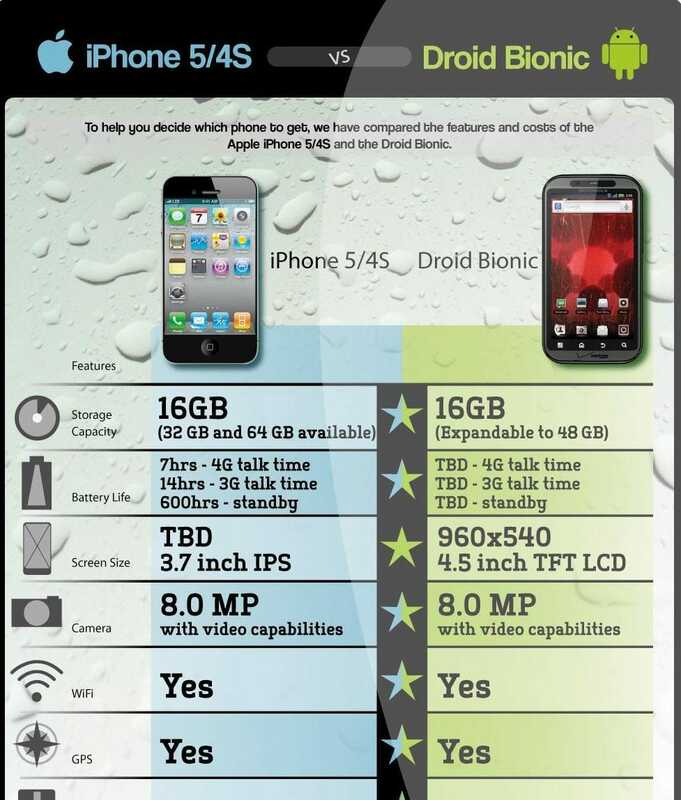 So let us look at the first one, which looks at the social opinions of the Bionic compared to the Galaxy S II. Now this is interesting, because these are the two Android handsets that are the most anticipated. 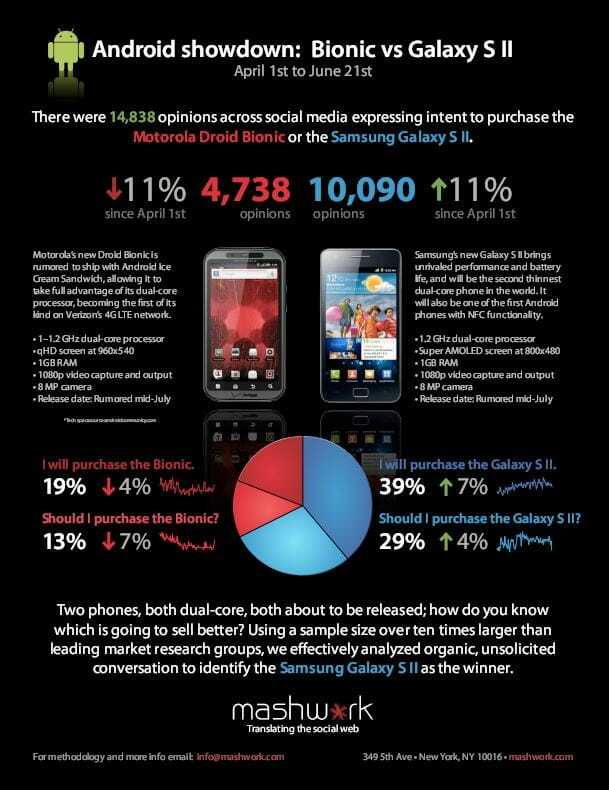 The results are from April 1, 2011 to June 21, 2011, and there was more social media attention for the S II. The Bionic had dropped 11 percent, while the S II had increased by that same amount. However, this could be very different today, as we are close to the release of both products. Next is a look at the Bionic against the HTC ThunderBolt. This is in two parts, as it is so large. You will get to see all the key features that are important to a phone, and we can already see that it is not a fair fight. 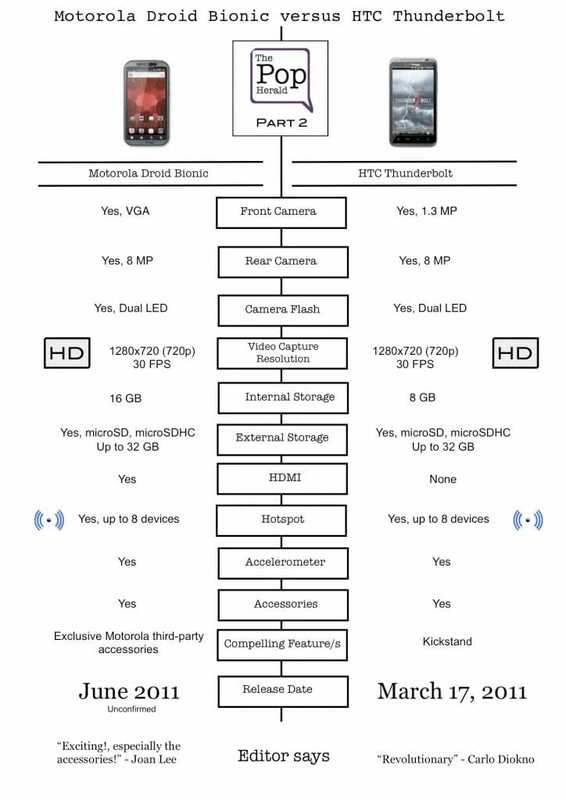 This is like a game of Top Trumps, and Motorola seems to have HTC trumped on every feature. 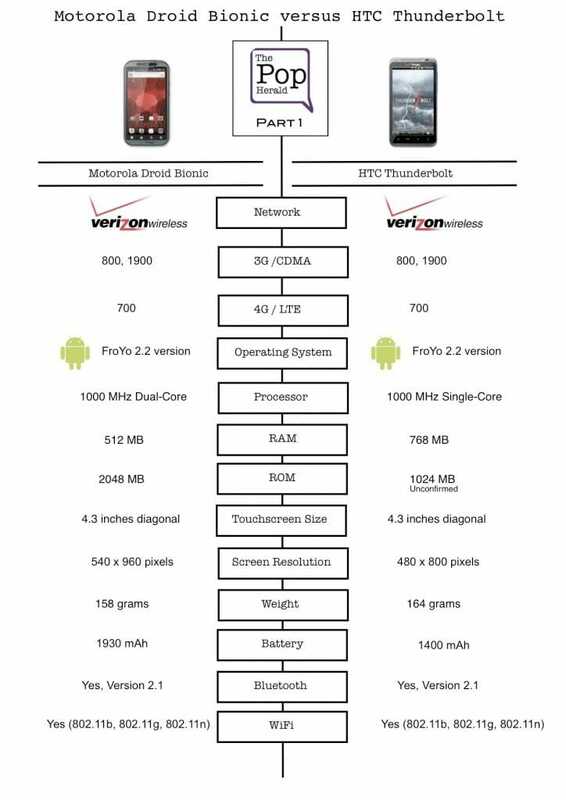 You cannot even compare the carriers, as they are both on/coming to Verizon. Our third infographic is like the one above, but also throws in the iPhone 4 for good measure. What we like about this one is how you can see how technology has changed, because the iPhone is about a year older than the other two phones. We can see what features each phone has and what they do not have, a red cross represents a missing feature. The Droid Bionic is lacking 4 key features, the ThunderBolt 3 and the fourth-generation iPhone 12, which was to be expected really. Trying to put the Bionic against the iPhone 5 is a little tough, as we do not know anything official just yet. However, this infographic has looked at what is presumed. We cannot help but notice that it states the obvious, such as storage, camera, color etc. However, we have noticed that it still shows the iPhone 5 to have a 3.7-inch screen, which we know could be larger now. Our final infographic looks at the features of the HTC EVO 3D and how it compares to the upcoming Droid. 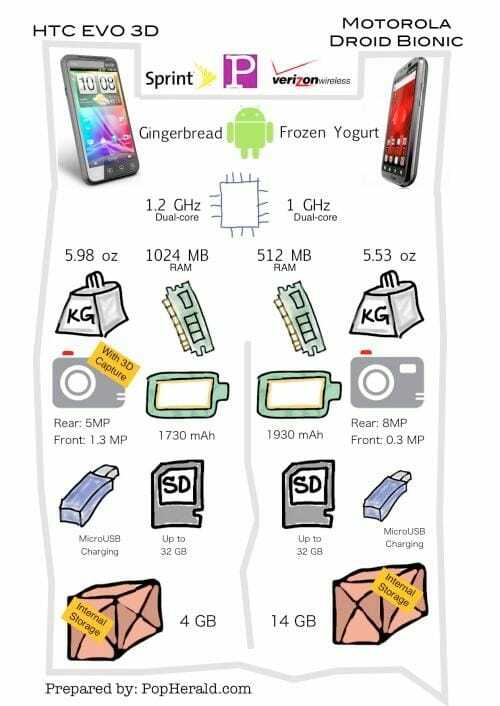 From what we can see, we expect that this was prepared sometime ago before Motorola decided to upgrade the hardware, although a few still look to be spot on. Are you still waiting on the Droid Bionic, or have you had enough? I am still waiting for the bionic. My bf called me this morning and told me that the bionics were in so I’m hoping he gets to test one as he did the Xperia Play, Charge, Revolution, and Xoom. It felt good to get my hands on these things before they were out. I love the Xperia Play but its not 4G so I don’t want it. do i even need to point out how ignorant this lazy scam to get people to come to this bootleg website, is. i hope that i wouldnt.